Some people used to claim that women are poetic but cannot write poetry. However, this idea depends on nothing other than sexist stereotypes. Poetry is abstract and sophisticated and according to this claim, empirically brained women have no business writing poetry. The aforementioned stereotype does not come from tradition; not in Turkey, at least. Turkey has produced many famous female poets since the classical Ottoman era and the modernization era also saw its share of female contributors, including famous poets. Unlike their Western peers, female Turkish authors were never obliged to use male pennames. Moreover, they felt free to use a feminine style in writing, rather than imitating the male-oriented style. Nigar Hanım is among the most famous authors of these. The late-19th century poet also wrote short stories, essays and plays. Nigar was born in 1862 in İstanbul to Osman Pasha, a Hungarian man who converted to Islam. Her mother, Emine Rifati, was the daughter of a top Ottoman bureaucrat. Nigar received her first schooling in a private dormitory school in the district of Kadıköy which was run by Madame Garos. She learned French, Armenian, Greek and Italian there. Nigar was learned Arabic and Persian from a private tutor named Ebüllisan ("Father of languages"), Şükrü Efendi. She received piano and painting lessons as well, eventually taken out of school when she became an adolescent to be privately tutored at home before marrying at an early age. She married İhsan Bey at the age of 13 and they had three sons: Salih Münir, Salih Feridun and Salih Keramet. She never loved İhsan Bey, which led her to have an unhappy life. Nigar called her marriage "her first disaster." Her second disaster was the death of her young brother one year after she married. Nigar left her husband and returned to her father's house at the age of 20. A few years later, she got divorced. In the meantime, she had her first volume of poetry, "Efsus!" (Alas!) published. This first poetry collection made her famous among prominent authors of the day and suddenly people wanted to know Nigar. "Efsus" is a collection of 16 poems and eight prose pieces. Despite being somewhat amateur, the poems and other pieces are attractive thanks to their sincerity and delicacy. Nigar published the second part of "Efsus," which was stimulating her to act as a literary character. The second "Efsus" includes 97 poems that show her enthusiasm after the publication of the first volume. These poems look like the Tanzimat period style, which slightly differed from the classical diwan style. Nigar had not been affected by the Edebiyatı Cedide (New Literature) of her time. In 1895, she married İhsan Bey for the second time to please her three sons, who were schooled in the Sultani (Galatasaray) High School. Indeed, İhsan Bey was working as an Ottoman attaché in Berlin in the first years of their marriage, and he took their sons with him to Berlin. Nigar had divorced İhsan despite his threats to separate her from her sons forever. Thus, her accepting a second marriage with the same man means that she wanted to be reunited with her three sons. Besides, her father had died, and she had no support in life. In 1896, Nigar published her third poetry volume, "Niran," the first volume of the Women's Library established to support Ottoman women. She was also the editor and publisher of "Hanımlara Mahsus Gazete" (Newspaper for Women). Sultan Abdülhamid II honored the poet with the Second Degree Badge of Kindness, which meant direct support from the sultan to the author. Nigar was very productive at the end of the 19th century. She published two more books, "Aks-i Seda" (Echo, 1899) and "Safahat-ı Kalb" (Phases of the Heart, 1901). "Aks-i Seda" was a poetry book reflecting her progress in writing, while "Safahat-ı Kalb" was a series of letters previously published in "Hanımlara Mahsus Gazete." The content of the letters is fictional, and it looks like a small novel. These letters show the real talent of Nigar in writing prose. Her style is a combination of emotional exaggerations and simple phrases. One can easily compare Nigar's style to that of Emily Dickinson from the United States. In 1902, Nigar divorced her unfaithful husband İhsan permanently. Since her mother and father had died earlier and her sons had become adults, she began to live as an independent female individual of the arts. She started Tuesday meetings in her family kiosk in Nişantaşı. She gathered men and women of the arts every Tuesday. These meetings are referred to as the "Salon of Nigar" as well. Nigar's guests include prominent authors such as Recâizâde Mahmud Ekrem, Süleyman Nazif, Faik Âli Ozansoy, Abdülhak Hâmid, Ali Ekrem, Ahmed Rasim and Ercüment Ekrem Talu, painters such as Zonnaro the Italian and Şeker Ahmed Pasha, musicians such as Furlani, Hegey and Tatyos Efendi, politicians and diplomats such as Münif Mehmet Tahir Pasha and Salih Münir Pasha and famous orientalists such as Ignácz Kúnos and Arminius Vámbéry. Unfortunately, Nigar's health was not very good. She visited her friend Emine Semiye, daughter of Ahmet Cevdet Pasha frequently. She also visited European cities, including Vienna, Budapest and Paris. She had a medical operation in Vienna in 1910. 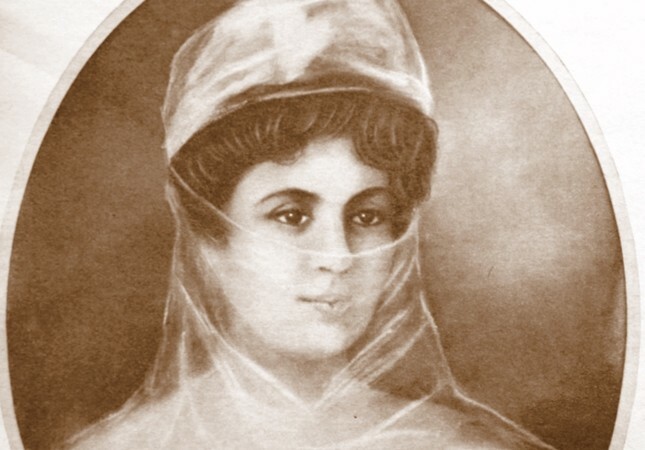 Though she was in an aristocratic circle, Nigar closed to the wide society after the Balkan War exploded to contribute to the struggle of her nation. She worked in charity and aid campaigns held for the army. She gave conferences and read her heroic poems to women to raise awareness in Ottoman society. Nigar collected her heroic poems in a special book, "Elhan-ı Vatan" (Songs of Homeland, 1916). However, Nigar was ill, lonely and broke. The state gave her a salary, but it was small and occasionally not paid due to the harsh conditions of war. Nigar died on April 1, 1918, and buried beside her mother and father in Kayalar Cemetery in the Rumelihisarı district. Her grave was moved twice, eventually placed in the Aşiyan Cemetery. The "Nigar" literary journal in Urdu was named after the Ottoman poet. Furthermore, Şair Nigar Street in the Şişli district of İstanbul was named after her.